For years, I have had my students write letters of advice to future students after state testing was over. 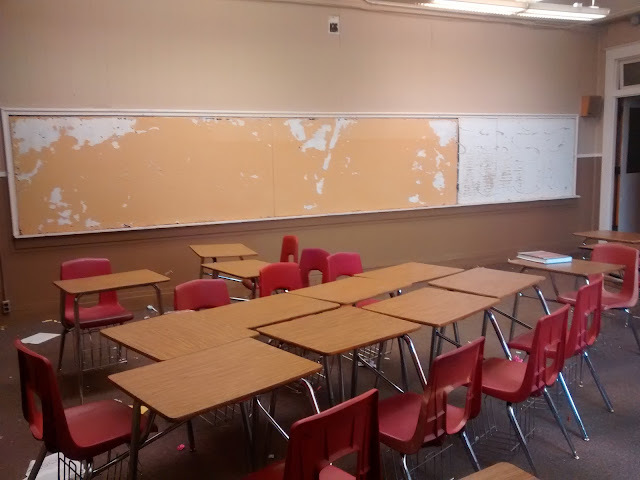 This year, my students did not have an end-of-instruction exam, so I was able to just keep teaching up until the end of the school year. So, this year was the first time in a long time that I didn't have students write letters of advice. 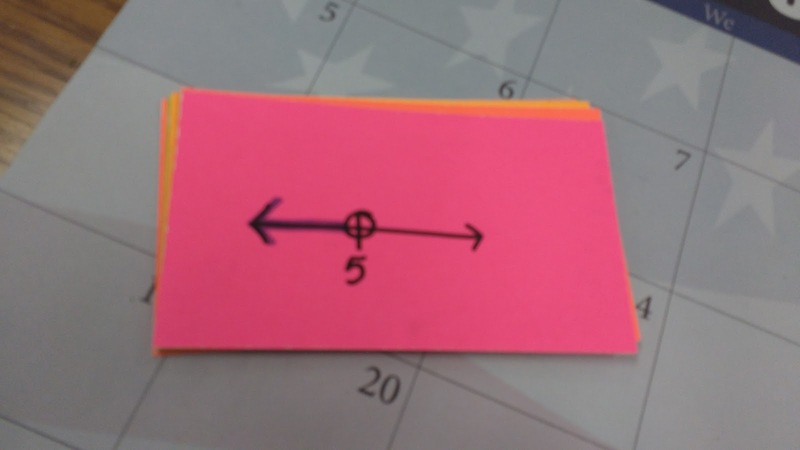 As I'm cleaning out my draft folder, I ran across a twist on the idea that I tried with my trigonometry students two years ago. Since I don't teach trig every year, I couldn't really have them write letters to the next year's students. 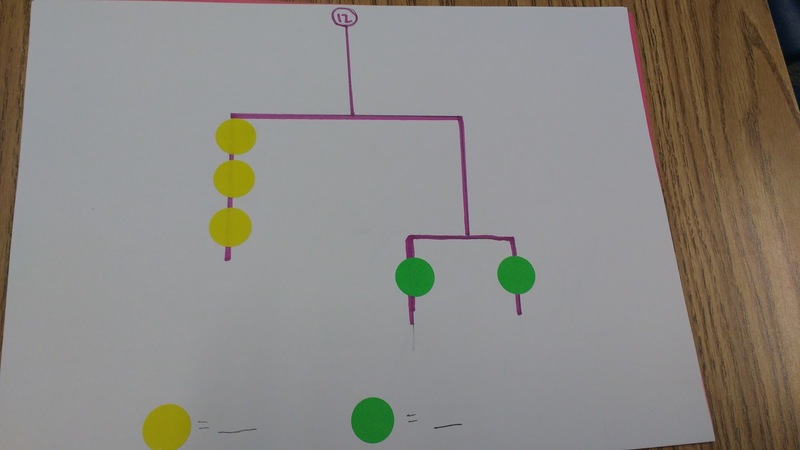 Instead, I had them write letters to their past selves with information they wish they had before beginning trig. You can tell these are from a couple of years ago because I was still Ms. Hagan, then! You were being dumb this year. You should have sat down and paid attention. You would have made better grades and would have done better on the ACT. When you come into trig, try hard to keep up with your notebook. Your notebook will be your absolute best friend. Pay extra close attention when Ms. Hagan is giving her lectures. Be sure to know how to do one lesson before you move on to the next one because more than likely the lessons are going to tie into each other. Wait to highlight your notes until after Ms. Hagan is done with explaining the examples. If you do not wait, you will get confused. Speak up and use your words more often. 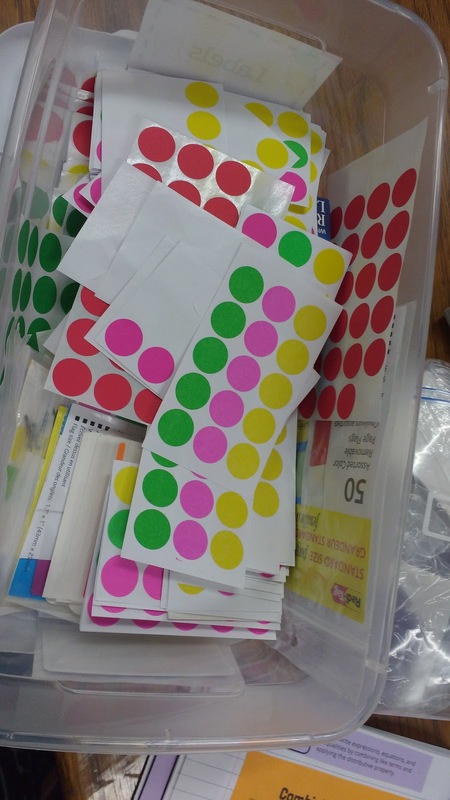 Participate in the games they play in class. You will have more fun that way. I promise. On Good Things Monday, you should participate. And, I promise that nobody will judge you. Tell your funnies on Friday funnies. You should pay more attention in class and work harder on in-class activities so you know what's going on. Don't be on your phone as much so you know what's going on so you can pass your quizzes the first time you take it so you don't have to come in after class. When we create a time machine and this gets back to you, there are some things I would like you to prepare for. You need to just study more and actually do your homework. Don't be on your phone as much so you can take better notes and pay attention better. Also, start bringing snacks to class because you are always getting hungry before lunch. 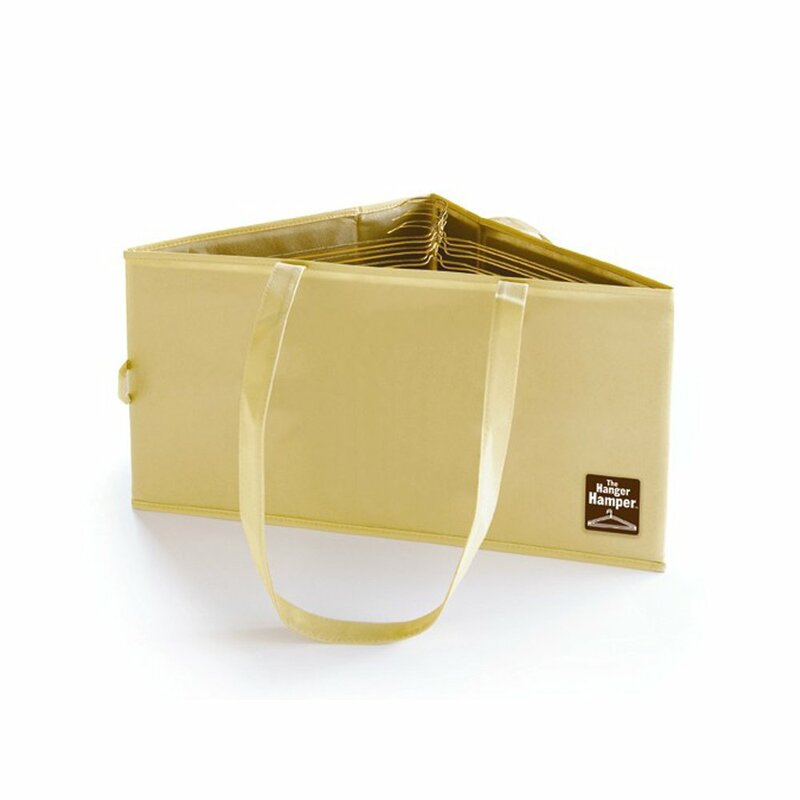 You should also keep your notebook more organized and numbered. Enjoy the days when you get to play uno! Those are the best days ever. The notebook is the best part of the class when you aren't playing games. I would suggest that you should pay attention... You really do learn more. If you don't know what's going on, raise your hand and ask a question. Ms. Hagan is there to help in any way possible. Practice truly does make perfect in this class. "Notebooks" are your best friend during class/tests. Oh, and keep taking any class Ms. Hagan offers. Don't be frightened about trigonometry. Definitely don't believe the horror stories you hear about it either. Trigonometry will actually make sense. Out of all math subjects you have learned so far, you will understand trig more than you understand any other math subject. Today's post has nothing to do with math, but it's something I want to share because I'm proud of it. One of the goals I've been working toward this school year is to get more organized both at school and at home. 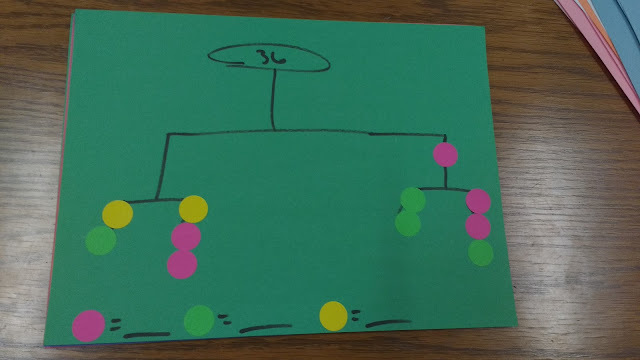 I've written several posts about my efforts to get organized at school, but I really haven't blogged about my efforts at home. 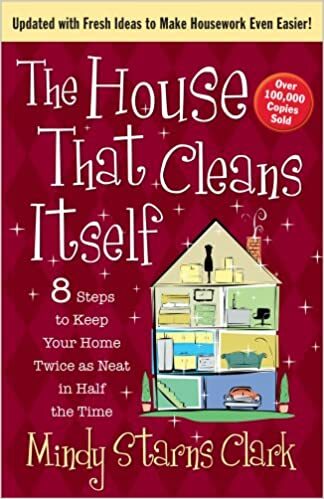 The book that is helping me to reshape my thinking is The House that Cleans Itself by Mindy Starns Clark (affiliate link). 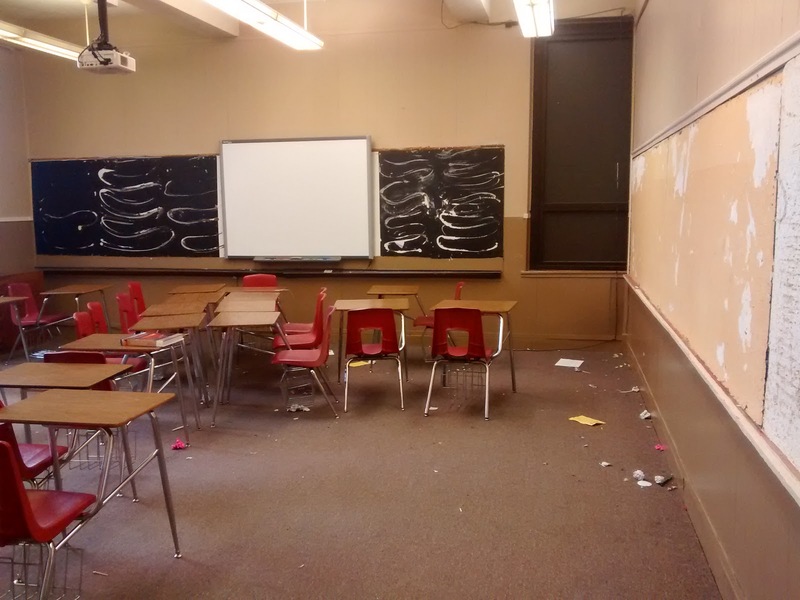 The premise of the book is to focus on why your house (or classroom) gets messy. If we makes things easier for ourselves to keep clean and organized, we have a much better chance of staying clean and organized. This basket sat on the floor of the laundry room. Everyday, I had a decision to make as I was getting dressed and ready for the day. 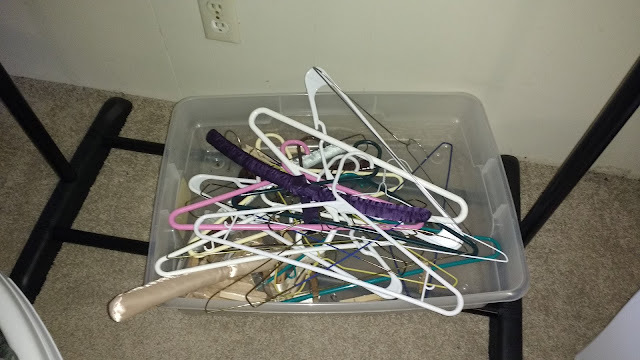 I could take my hangers and walk across the house to the laundry room to put them away, or I could take the hangers and hang them off one of the knobs on the cabinets above the closet. Once I made the latter decision once, I would continue doing so. Except, soon I would have to hang the new hangers off of other hangers to make room. Eventually, these would end up tumbling to the floor and laying there until I went through the house in a cleaning frenzy. I went looking on Pinterest for a solution. I do have to admit that my husband did all the work after this point. I told him what to buy and showed him the picture, but he did the actual purchasing and hanging of the brackets. 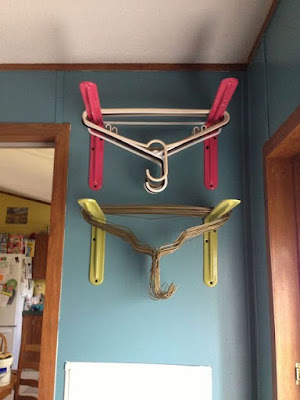 This only solved part of my hanger problem. The hangers in my laundry room now looked much more organized. In a way, it was almost fun to put a hanger on the brackets. This still didn't cure the fact that often I was too lazy to walk all the way to the laundry room each time I needed to put away a hanger. Enter the hanger hamper (affiliate link). I purchased two of these - one for each of our closets. These hampers sit on the floor right inside (or outside - it depends on the closet!) the door. 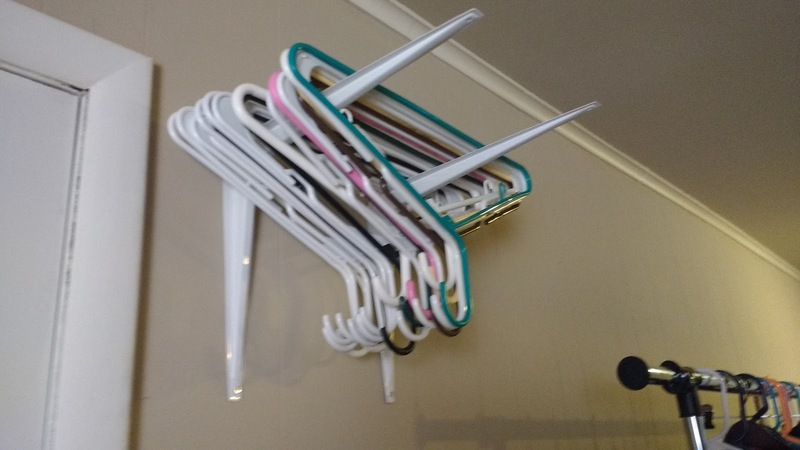 When I put on an article of clothing, the hanger goes straight into the hanger hamper. No excuses. This means that my hangers are now so easy to put away that I don't dread doing it. 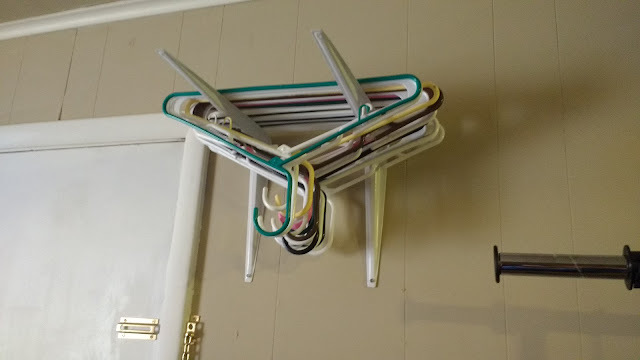 When the hanger hamper gets full or we run out of hangers in the laundry room, it's easy to transport the hangers to the laundry room and hang them off the shelf brackets. Does my house stay magically clean now? No. I definitely have a long way to go. But, hangers are no longer a source of clutter and mess. Now, I just need to find solutions for all my other problems. Thanks for putting up with a post that has zero to do with math or education! Don't worry. I'll be back to posting about teaching tomorrow! 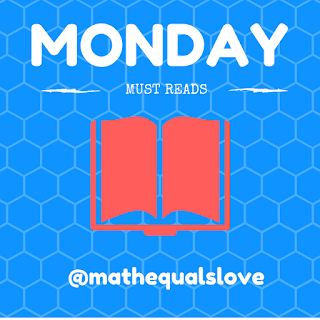 It seems like it was just yesterday that I decided to start Monday Must Reads as a weekly feature to highlight the awesomeness I see daily through the blogs I read and the inspiring teachers I follow on Twitter. Rick Barlow's tweet caught my eye not because of what the student had written on the board but because of the poster hanging above the dry erase board. I think this poster belongs in every math classroom. This is definitely on my list of posters to create for my classroom for next year. 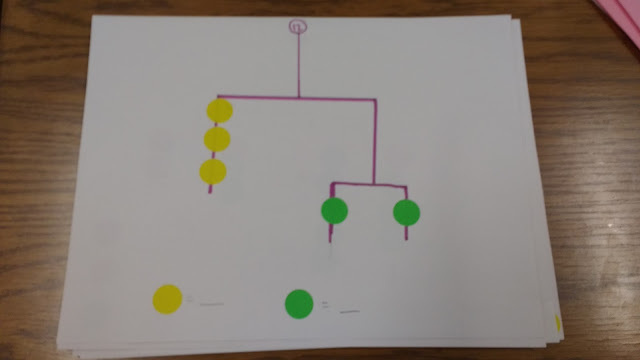 Greta Bergman recently published a beautiful blog post about her approach to introducing students to solving systems of equations by substitution. I love how she approaches it from a task that students should feel comfortable with and slowly moves students toward the way problems are typically approached. I think we can all learn something by checking out this post! Lately, I've been giving a lot of thought regarding how to incorporate more visual models into my Algebra 1 classroom. 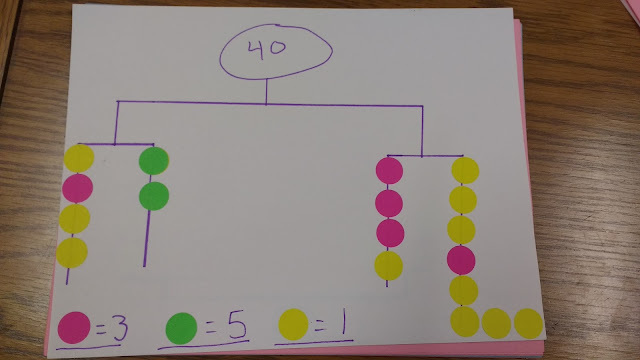 I was super excited to see Gareth Metcalfe post a new-to-me visual to use with students when working through problems involving mean (average). Watch out, though. Each diagram includes a mistake that must be identified! Click here to see a high-res image. 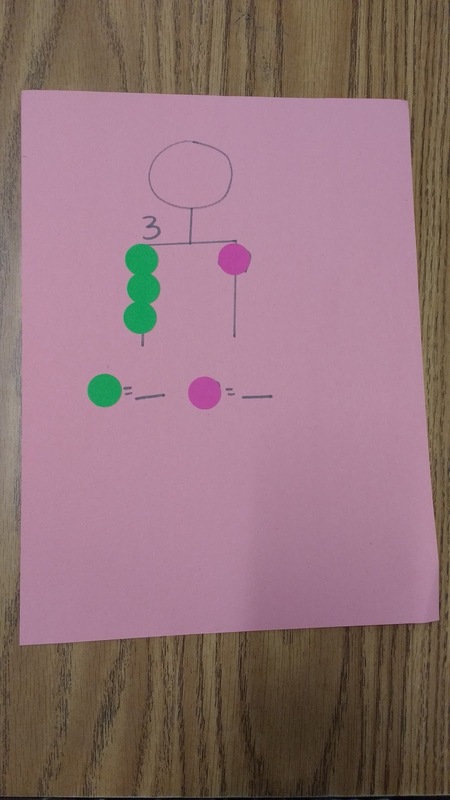 In the most recent issue of Monday Must Reads, I featured a visual representation for solving equations. 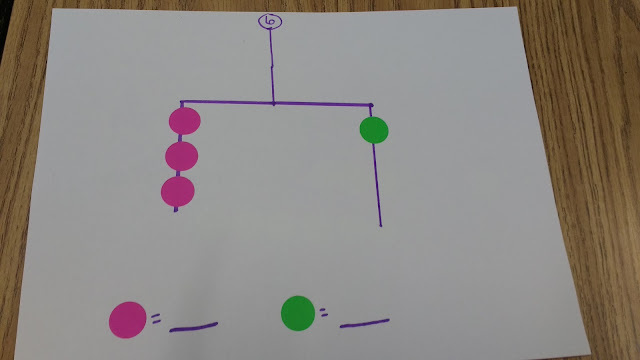 I wondered how it might work with equations that have variables on both sides. 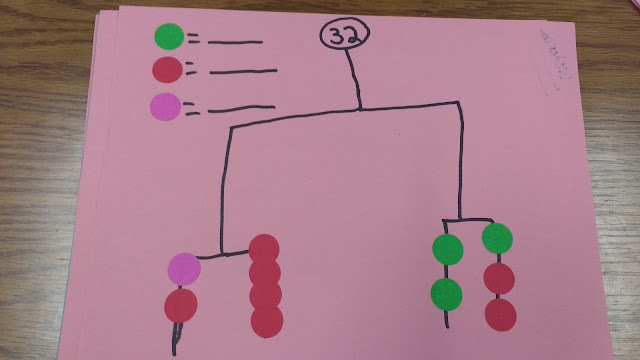 Yah Lee answered my question with a visual model that does just that! I've played around with it, and I like it. 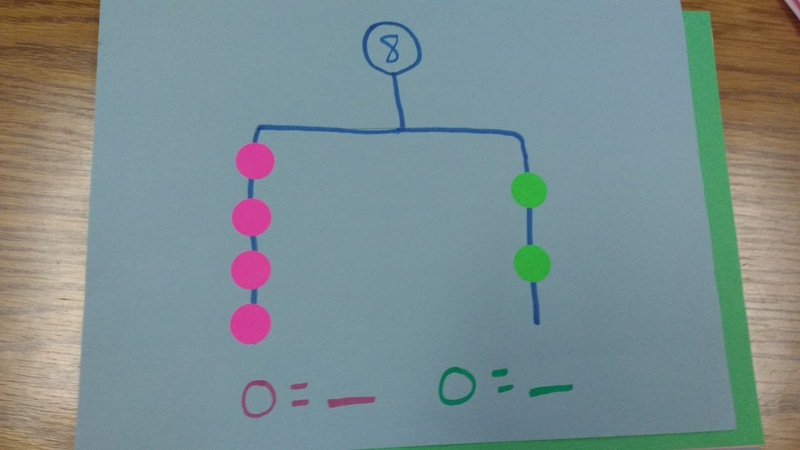 The only thing I can't figure out how to do now is illustrate an equation that involves subtraction one one side of the equal sign and addition on the other side. 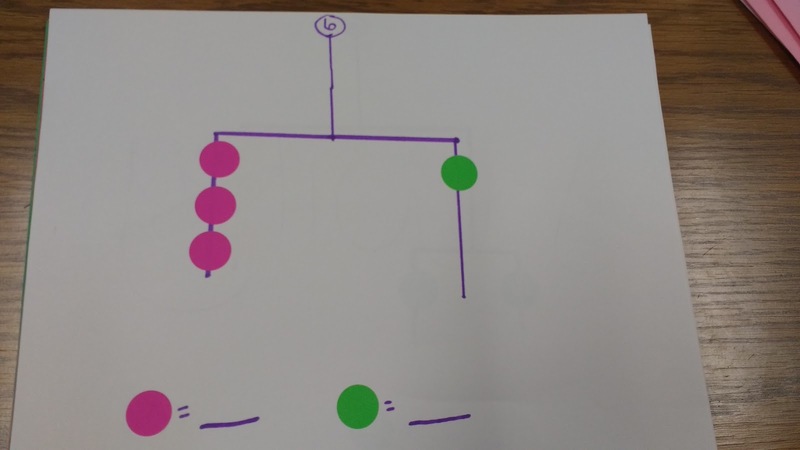 I was first introduced to Conway's Rational Tangles problem through a summer immersion program hosted by the Tulsa Math Teachers' Circle. 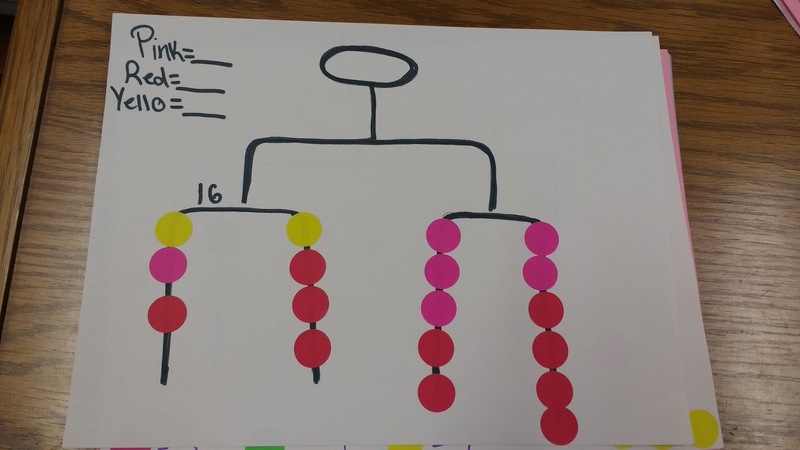 Amie Albrecht shared in a recent blog post how to use the questions "What do you notice?" and "What do you wonder?" to motivate the activity. I think this approach is simply brilliant. A recent twitter conversation between Annie Perkins and Jeffrey Jones both caught my eye and blew my mind. 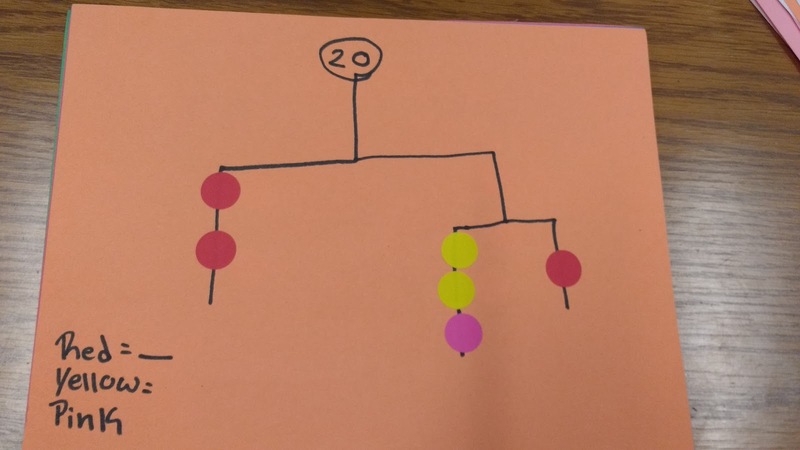 Annie asked the MTBoS for an exploration of e. Jeffrey Jones blew my mind by sharing the fact that if you roll a 20 sided die until the cumulative total is greater than 20, it will take on average e times. How is that even possible?!? 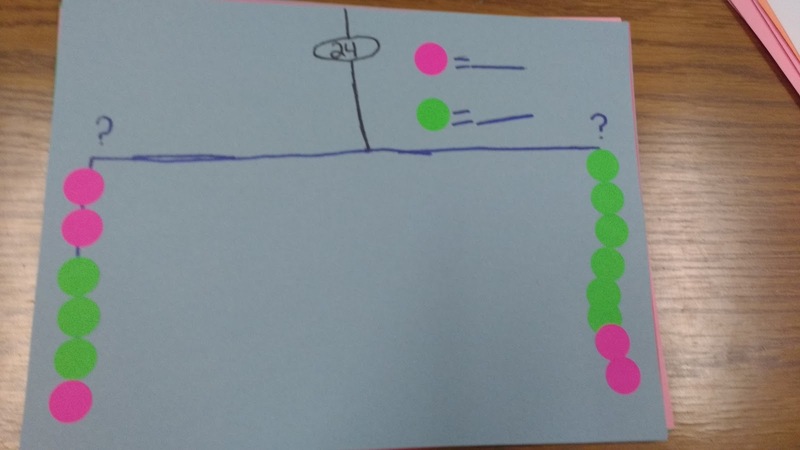 When I get time, I would like to explore this problem with dice of different numbers of sides to see what other exciting mathematical discoveries await. Thanks Annie for asking an awesome question so I could learn this fun, new fact! 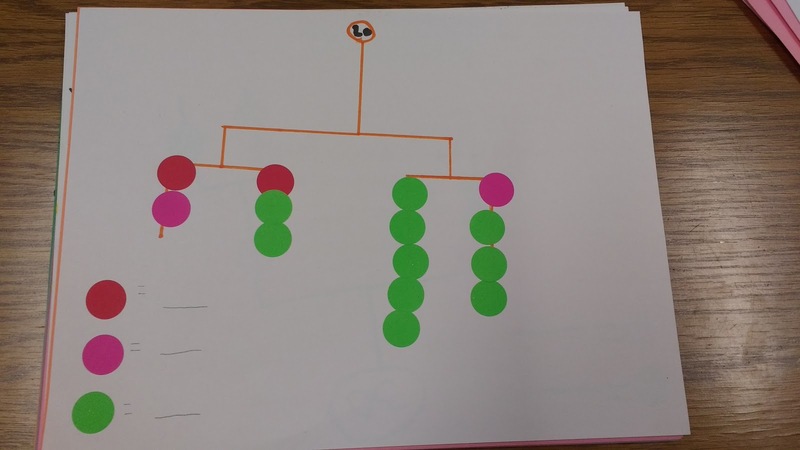 Katrina Newell blogged about her interactive notebook pages for angles formed by secants and tangents. I love how she encouraged her special students to use two small pieces of paper to better visualize the arcs and angles. 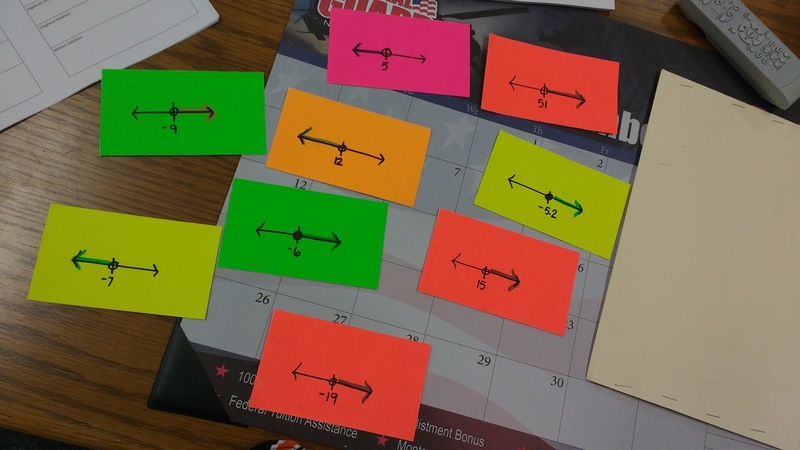 I think this is a strategy that all students could benefit from! I also love the vinyl decoration she created for her mug! Maths teachers in the UK have been honouring the late Malcolm Swan's contributions to maths education by using his resources in their classrooms on #malcolmswanday. 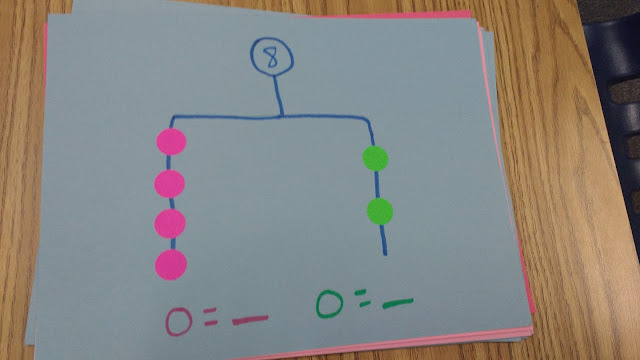 Pip Mathematics shared a great Swan task that I look forward to incorporating when my Algebra 1 students tackle evaluating expressions in the fall. 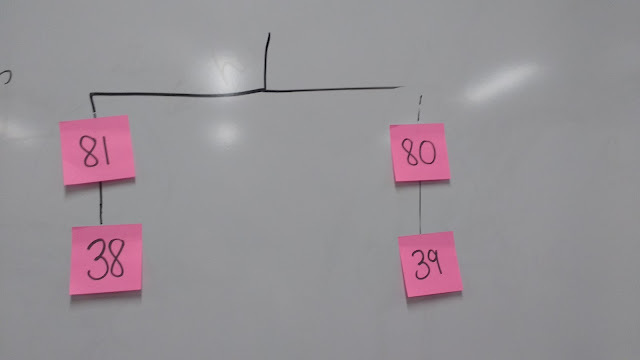 Theressa Engel shared students' results to a problem-solving task I would love to try out with my own students: create the longest chain possible from a single sheet of paper. I'm thinking this would make a great first week of school activity! 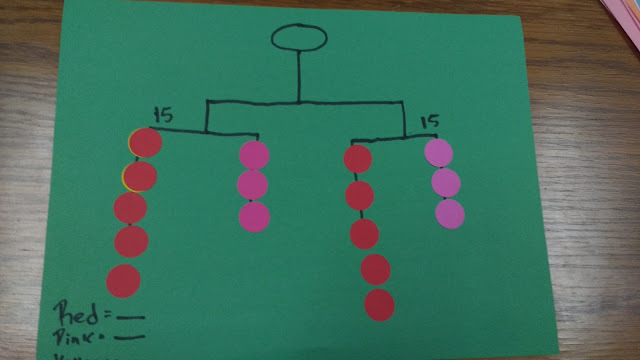 Sam Shah recently shared a brilliant introduction to the unit circle in trigonometry using every shape but a circle! 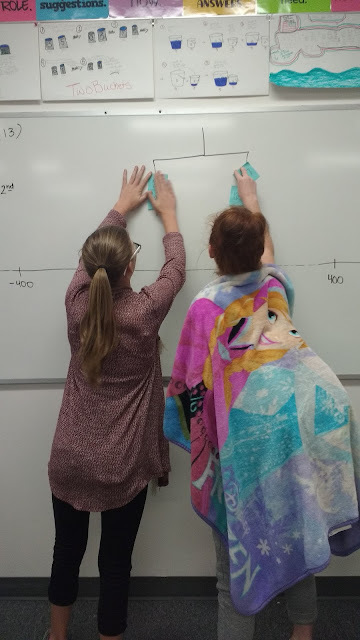 Susan Russo took the traditional spaghetti activity for graphing sine and cosine curves a set farther by hanging them side-by-side to create a beautifully long graph. Andrew Jensen shared a brilliant geometry task regarding wasted packaging space. Until next time, keep sharing! As I've been going through my draft folder, I find many posts that are easy to delete. Occasionally, though, I run across a post and wonder "Why didn't I ever finish that?!?" This post is one of those. 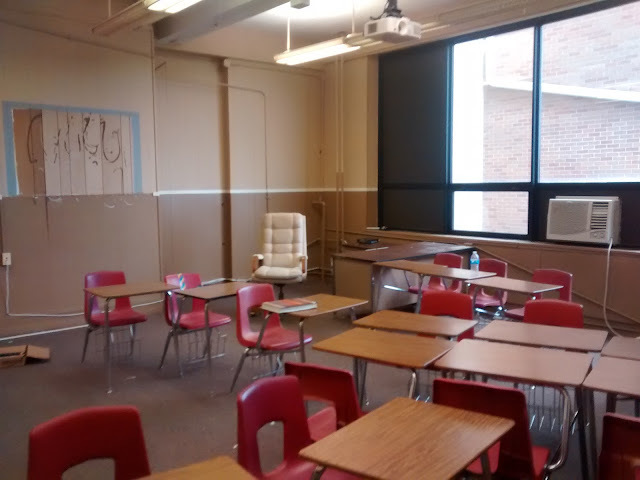 I've now completed my first school year in our newly-designated 7th-12th grade building. Here's a blog post I wrote but never published last summer. I'm not entirely sure what to blog about today. 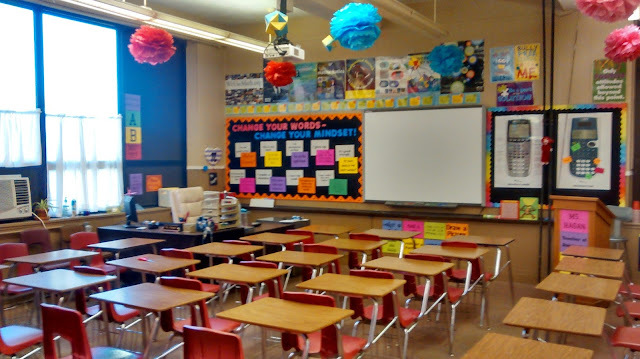 I did some major decorating work in my classroom yesterday, but I left without taking pictures. So, those will have to wait for another day. 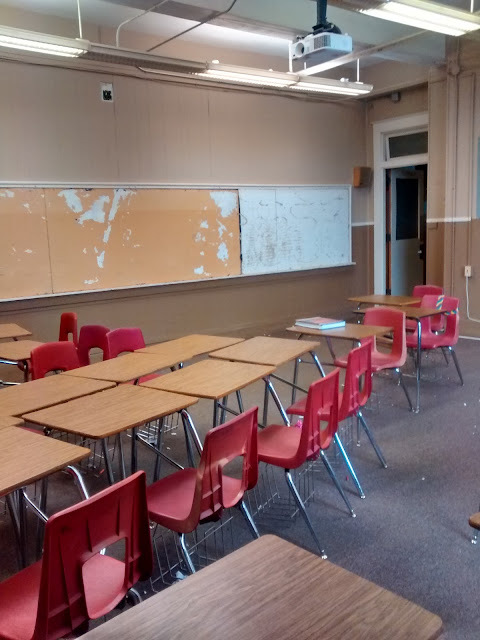 I did take a few pictures of my old classroom. I'm still teaching high school math next year, but I'll be doing so in a 7th-12th grade building instead of a 9th-12th grade building. This means I'm leaving behind my first and only classroom. 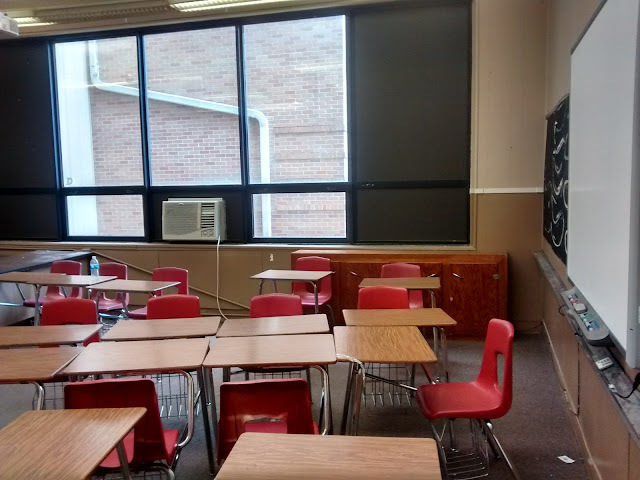 Is my new classroom nicer? Definitely. It's bigger. It's newer. It has an entire wall of cabinets. Of course, it's not right next to the copy machine/teacher's lounge/staff restroom. But, I think I'll be able to cope with that this year. 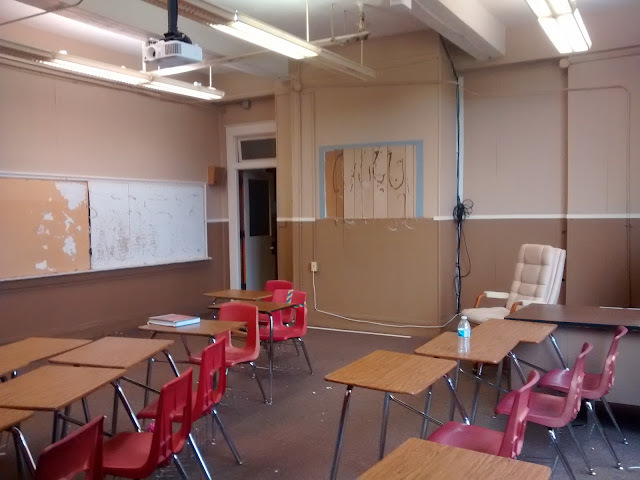 But, this classroom, the place where I truly learned how to be a teacher, will always hold a special place in my heart. 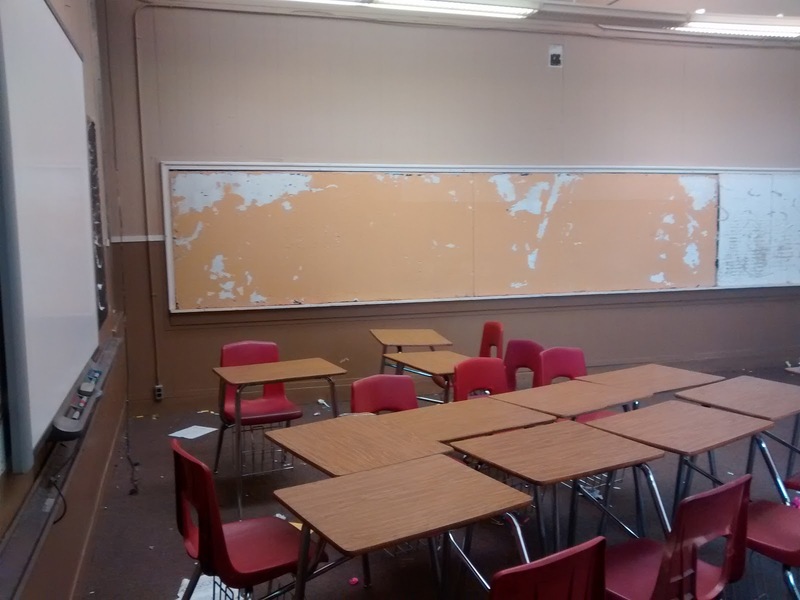 My parents and sister came up last Friday night to take down my dry erase boards and bulletin boards and move them to my new classroom. 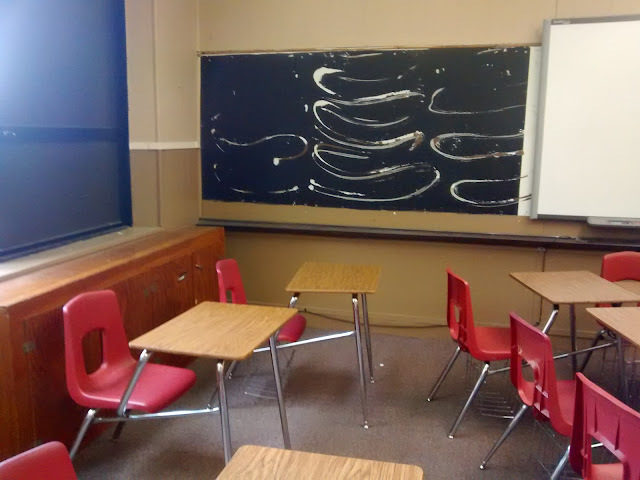 This leaves my old classroom looking much like it did when I first saw it. Here's the blog post where I first shared pictures of my classroom so very long ago. 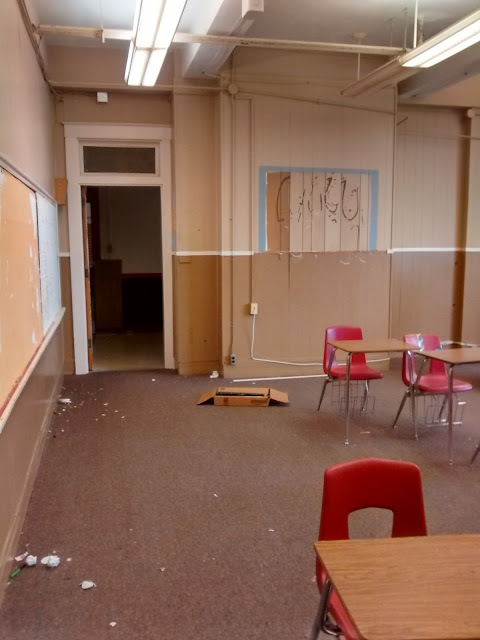 After spending hours painting and decorating this classroom to make it a bright, cheery place for students to learn, it's sad to see this place I love so much look so sad. 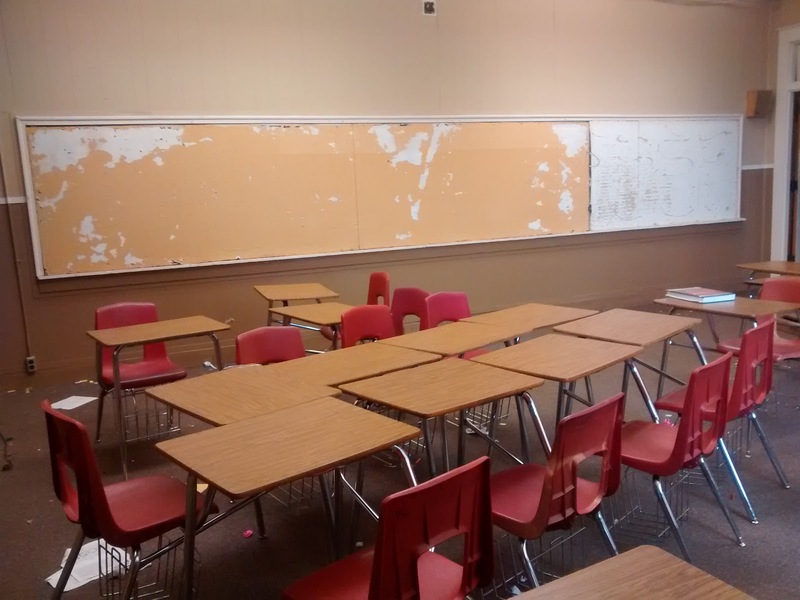 No more math will be learned here. As I'm working my way through my folder of blog drafts, I'm realizing that most of the ideas have found their way into other posts. 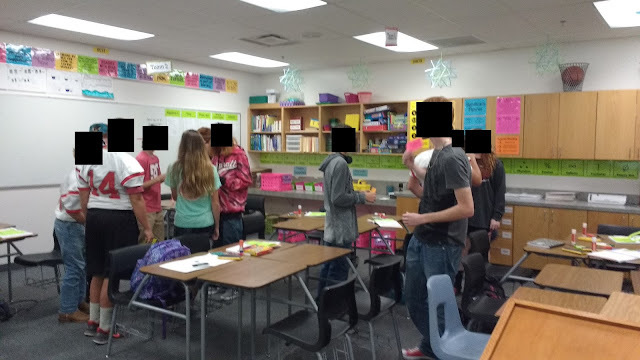 This post contains an idea that was mentioned in another post, but I never got around to sharing pictures of what the activity actually looked like. 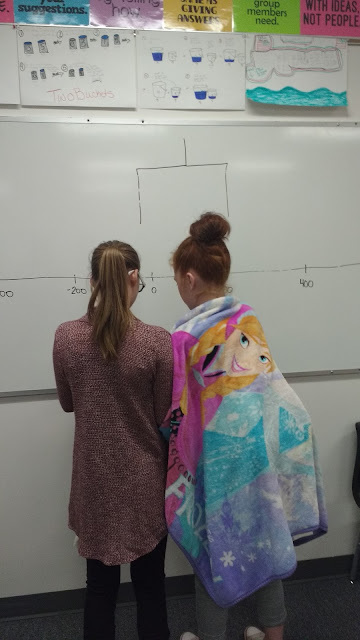 I wanted my Algebra 1 students to be able to quickly glance at a graph on a number line and determine the algebraic inequality that would produce that graph. I created a set of speed dating cards using sharpie, pencil, and colored index cards. 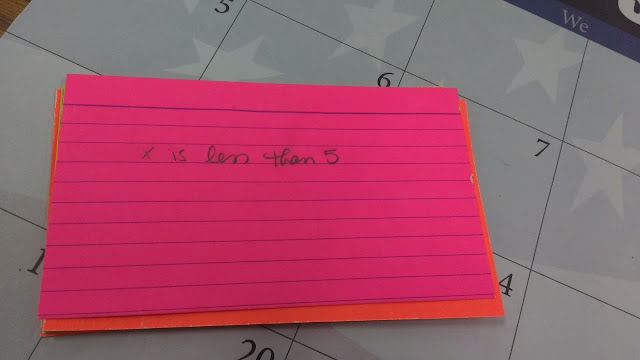 The index cards don't have to be colored, but I find that my kids have much more trouble seeing through the colored cards than the plain white ones. Please tell me I'm not the teacher who has the few students who waste more time trying to read the answer on the other side instead of just answering the question. I used sharpie for the graphs and pencil for the answers in the hopes that I could prevent cheating even more that way. So, how does speed dating work? 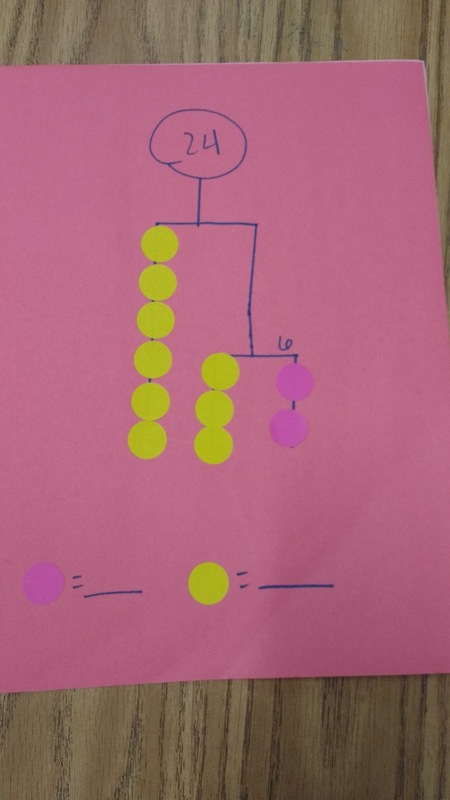 Each student is given a card with the graph facing up. 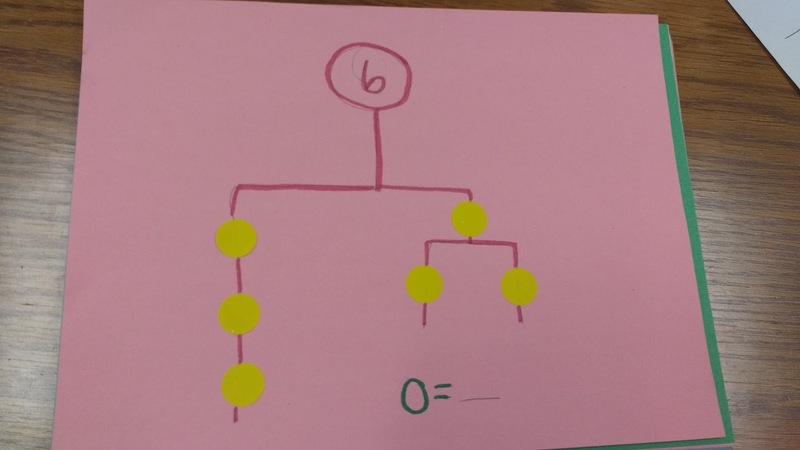 Once they have determined the inequality that produces their graph, they flip the card over to check their answer. 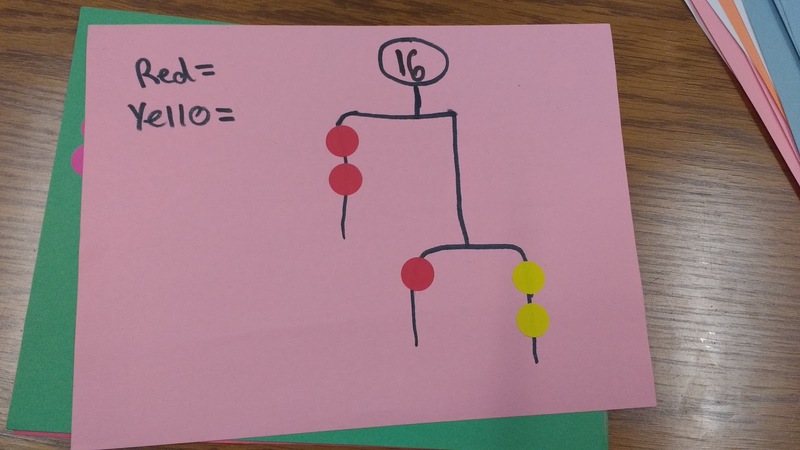 Once all students have had ample time to solve the problem on their own card, I have each student stand up and find a partner. 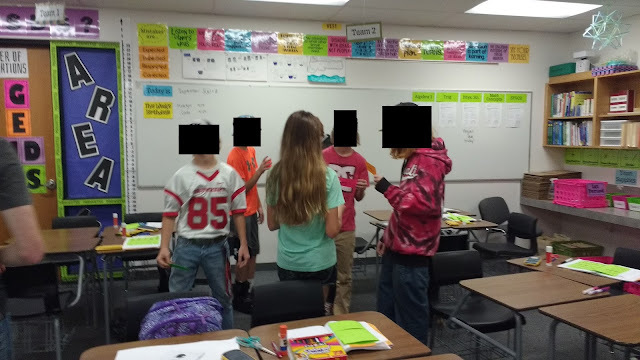 Students hold their cards up to their partners with the problem facing out. I tell my students that in speed dating, the goal is to meet as many people in as short of time as possible and exchange contact information in case you later decide you want to get to know someone better. In class, our goal is to get as much practice naming inequalities as possible. Students take turn answering the other's question. 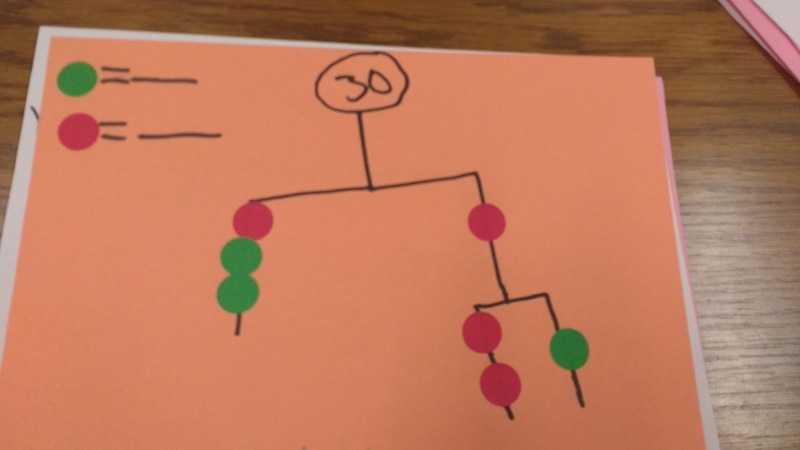 Each student coaches the other student through the solution if necessary. Then, students trade cards and find a new partner. This continues until the teacher calls time. 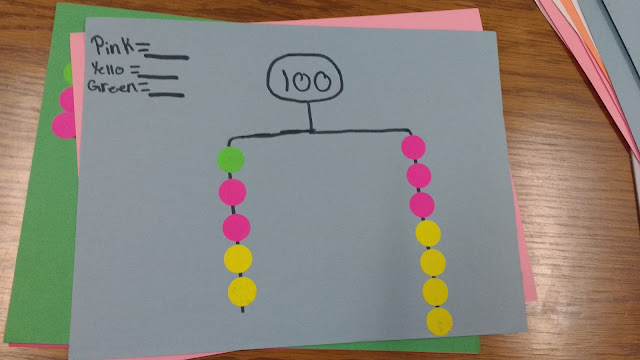 One of my summer goals is to take these speed dating activities that I have handwritten on index cards and turn them into share-able digital activities. I'll be sure to share once I get this done! I'm back to cleaning out old draft posts. 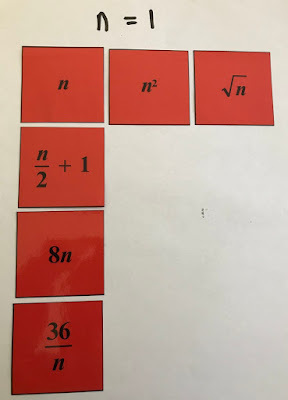 Today, the plan is to share about a sticky note challenge I issued my math concepts students. At my school, math concepts is a class for freshman that are not yet ready for Algebra 1. 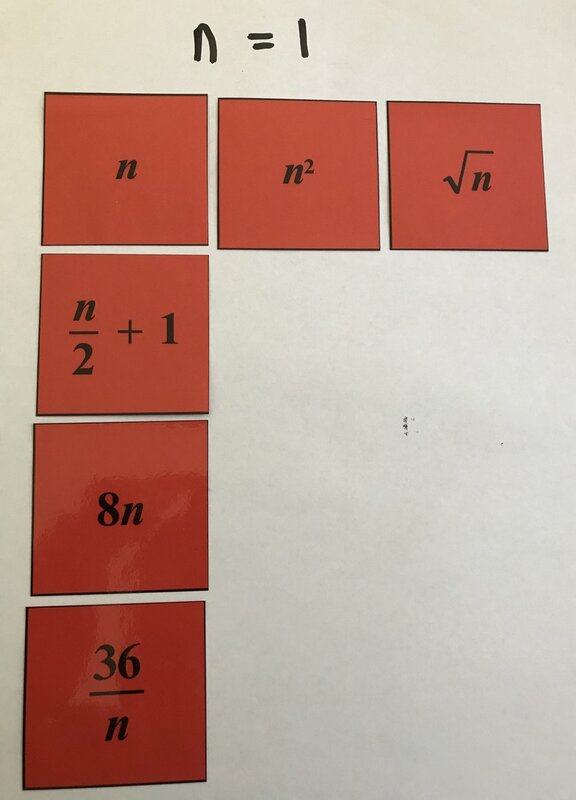 The puzzles in this post were taken from the Transition to Algebra curriculum. Students were placed in pairs and given four sticky notes with the four values (example: 80, 81, 38, and 39) written on them with marker. 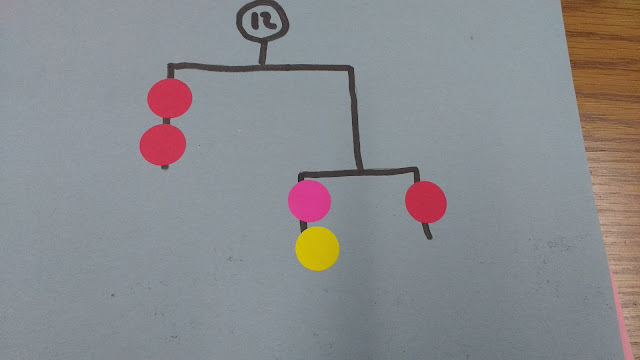 Each pair stood in front of a hand-drawn mobile on the dry erase board. 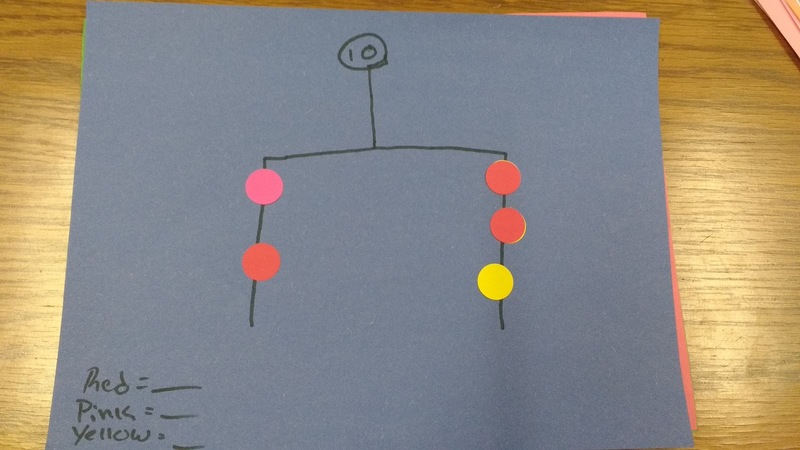 When I told them to go, they had to determine how to place sticky notes on the mobiles so both sides would be equal. 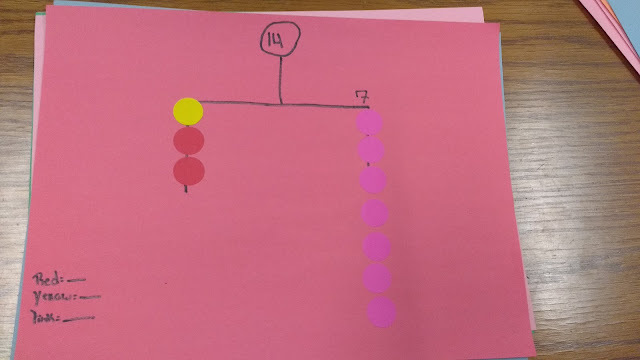 This sparked a lot of awesome conversation between the students in each pair. 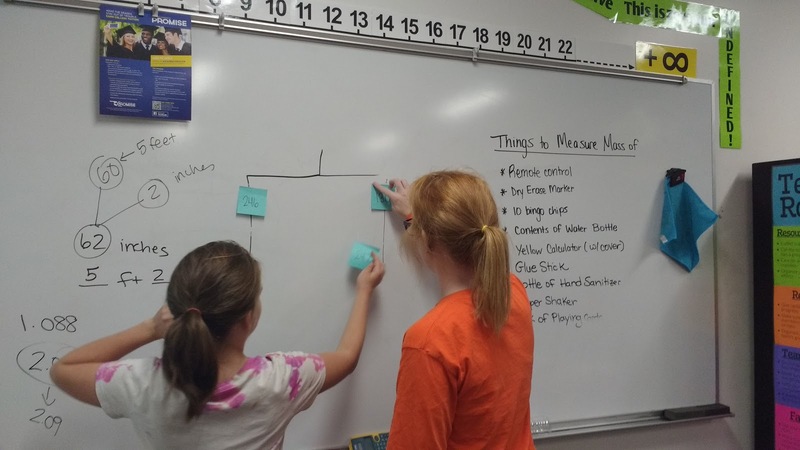 Students were asking each other to justify their placements, and it was a beautiful sight to behold! 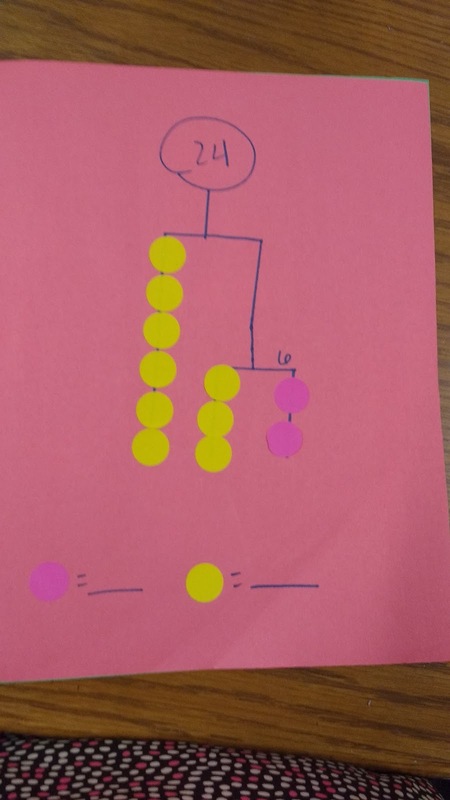 Looking back at this activity now, I'm now wondering how I could create a similar activity within the Algebra 1 curriculum. Any ideas? The only idea I've had so far is to make mobiles that require students to combine like terms. It's summer which means it's time to clean out the drafts folder in Blogger! This post has been sitting as a draft since September! 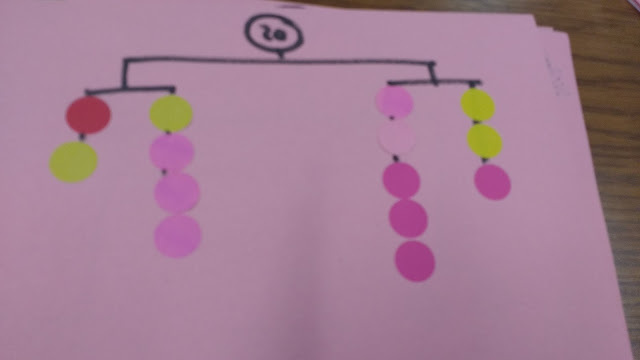 My math concepts class (a class for freshman not yet ready for Algebra 1) really working on SolveMe Mobiles this past year. If you aren't familiar with SolveMe Mobiles, you need to follow the link right now before you continue reading. After spending several weeks on these puzzles, I challenged my students to make their own. 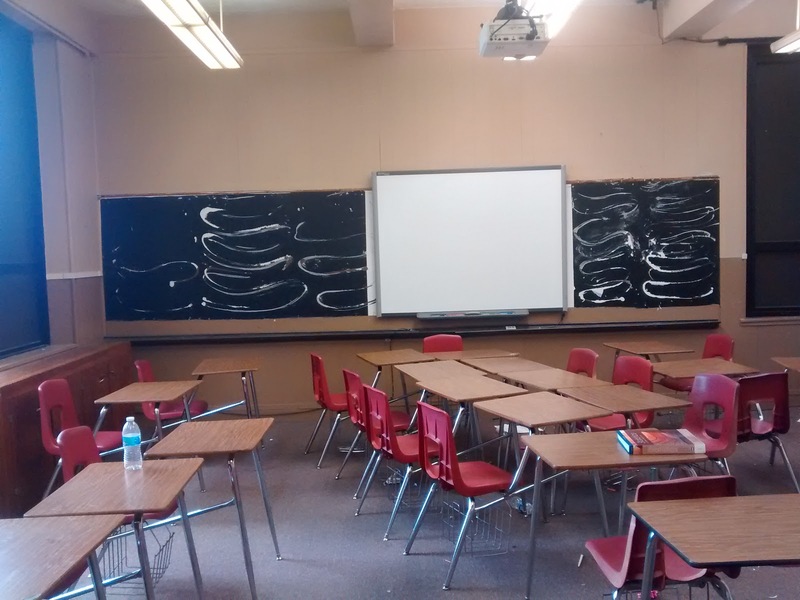 They drew their rough drafts on our individual dry erase boards. Then, after their mobile was checked by me, they recreated it using construction paper (affiliate link) and circle stickers (affiliate link) .